Dr. Feelgood by Benefit Cosmetics is a complexion balm that is designed to be put on over makeup to reduce fine lines and pores. It should not smudge your already perfect makeup application or feel greasy but just give you that extra bit of coverage for a flawless mattified complexion. It can be worn alone or over the top of makeup. The balm contains vitamins C and E which helps fight the signs of aging and also help with the production of collagen. I have summarized the information below from the opinions of the ladies using the face balm. Corn Starch Modified, Diethylene Glycol Diethylhexanoate, Neopentyl Glycol Dicaprylate/Dicaprate, Isosteryl Meopentanoate, Silica, Polyethylene, Ethylhexyl Isononanoate, Carnauba (Copernicia Cerifera) Wax, Tridecyl Trimelitate, Diethylene Glycol Diisononanoate, Chamomile (Anthemis Nobili) Flower Extract, Retinyl Palmitate, Tocopheryl Linoleate, Ascorbyl Palmitate. Pat and smooth over makeup with its accompanying sponge. Just remember that "less is more" as one user rightfully said, if you apply to much it can feel slimy. The majority of ladies using the Dr. Feelgood balm relish its effectiveness at minimizing pores and mattifyng their skin. However, some users found it irritating on the their sensitive skin and a few said it made them breakout. I think it is a little pricey at $28 for a 0.58oz tin, although many fanatics think it is well worth the price. 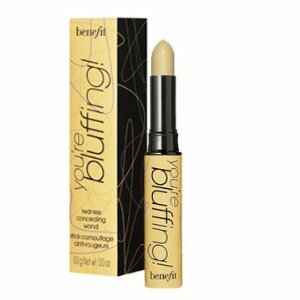 Benefit Cosmetics You're Bluffing Concealer is devised to cover any redness and imperfections you don't want others to see. The concealer comes in lipstick type form which makes it ideal to put in your bag if you need a quick touch up through the day. It comes in a yellowish color cream to neutralize redness and cover up any blemishes. Benefit says it works well for around the nose and chin. As it is in cream form it should be smooth and easy to apply while also lasting longer than liquid concealers. I have gathered the information below from the users opinions on the dooyoo.co.uk site. The mass majority of ladies using the concealer adore how quick and easy it is to apply. They also like how it covers redness well without looking cakey. Although, there are a few users who find it a little greasy and quite pricey. I do agree that it is expensive at $22 but most do say it is worth the price and it lasts a long time. Confessions of a concealaholic is a set of 6 concealers designed to hide anything you want to hide. It is devised for the medium skin tone. That Gal- a brightening facial primer. I personally find it a bit strange how Benefit has mixed light and medium shades together into one kit, as some of the shades will be too light for medium skin and vise-versa. I suppose 2 shades could be mixed together to create one perfect shade. Most users think confessions of a concealaholic is an excellent buy at $36 for the set. They like how it has everything to hide all those horrid imperfections. The only downside I found one patron commented on is the chunky case that the kit comes in. Compact is usually a plus for most of us, good for travel and fitting into that already bulging makeup draw. Avon Ideal Shade Concealer Stick is designed to provide full coverage for dark circles and blemishes. It comes in a wide range of shades to suit very light or dark skin tones. It comes in a lipstick like form instead of the usual pot form that most concealers come in. This lipstick like design is quick and easy to use. It doesn't even require the use of a concealer brush as it can just be dotted directly onto the skin. Avon have a lot of decent products that are reasonably priced, that makes them even more appealing. For best results for any concealer pat on the problem area them gently smooth out. Concealers can be used under or on top of foundations. Just don't use to much or it will look cakey. Avon's concealer stick has been rated very high with users. They are very satisfied with the coverage and how quick and easy it is to use. A couple of people were disappointed that it doesn't cover scars. If you fancy giving Avon Ideal Shade Concealer Stick a try it retails for $6. Which is a total bargain considering most other brands cost 3-4 times as much. Boi-ing is a concealer designed by Benefit. It apparently is industrial strength so go easy when applying. 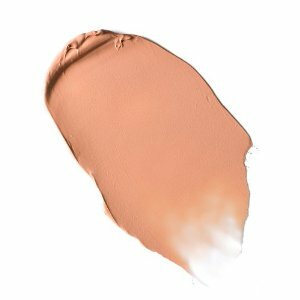 This concealer is formulated to cover the darkest of circles and any other impurities such as , broken capillaries, scars and boo boo's as well as still looking natural. Boi-ing comes in three shades light, medium and dark. If you aren't sure the best color to suit your skin tone, it is always best to pick the medium. Benefit say that this concealer is industrial strength, but it doesn't go into detail about how this different from other concealers. I have compared the ingredients from this concealer to a few others and they seem to be practically the same, so if this product is industrial strength so is most other products. Warm the concealer first by patting between two fingers, this will make it smoother to apply. Whether you use a brush or your finger to apply the concealer try not to use a huge amount other wise it won't like natural and will be more likely to build up in the creases. Dioctyl Adipate, Octyl Stearate, Talc, Beeswax, Carnauba (Copernicia Cerifera) Wax, Petrolatum, Corn (Zea Mays) Oil, Octyl Palmitate, Propylene Glycol, Butylparaben, Ctiric Acid, BHA. May Contain: Titanium Dioxide, Iron Oxides. 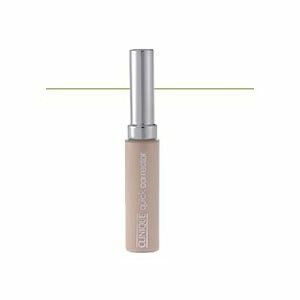 Most patrons of Benefit agree that this concealer does cover most problem areas and lasts all day long. However, a few users find it to be too heavy and waxy. Applying a thinner layer would help to make it appear lighter. It is quite pricey at $18, although no users I found mentioned the high price. You are currently browsing the archives for the Concealers category.